17. Posts to become a Versatile Blogger! 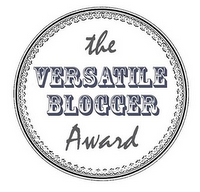 Hats off to Rylee for doing what the rest of WP should have done months ago, and nominating me for a Versatile Blogger award! In all seriousness though I’m very flattered, and all the more so because I’m a big fan of The Lime. Her blog provides a full spectrum of reading entertainment through fiction, poetry, opinion pieces and bits of fitness banter. Ok, I guess I could say about 80% of blogs out there cover those topics, including this one, but she still has that extra something that sets her apart from the rest. So then, this award. It isn’t too hard to come by, in fact all you need to do is be nominated and it’s yours, but I still think it’s a good way to get to know people you’re linked with and a nice way of showing other people you appreciate their writing. Thank the award-givers and link back to them in your acceptance post. Share seven (7) FACTS about yourself. Award 15-20 other bloggers the versatility award. Contact your nominees so they know you nominated them. 1) As my nomination was from The Lime, my first fact will be fitness related. I’ve completed 5 cycling tours in Europe; one has crossed the continent from North to South and another from West to East. The North to South one was from Calais (very Northern France) through Belgium, Luxembourg, Alsace-Lorraine, Switzerland and Italy, ending in Chiasso/Lake Como (Swiss/Italian border). The West to East was from Paris to Budapest, going through France (obviously), Switzerland, Germany, Austria, Slovakia and Hungary (obviously). I’ve been accredited in a book another cyclist wrote while travelling from Britain to Italy on a cycling trip for some advice I gave him for the journey. 3) One day I hope to be able to earn enough to make a standing donation to the Volunteer Development Poverty Children’s Association of Siem Reap, Cambodia. I went there twice in my gap year as a volunteer teacher and met the initial founder before he died in a traffic accident, and it made quite the impact on me. 4) As a general rule, if something is Freshly Pressed, I’m not going to like it. 5) I was attracted to Literature growing up because of the type of person it produces. I like people who aren’t sheep, which is why I can get a little turned off when I see people refer to “we” bloggers or “bloggers unite!” as if we’re all in the same boat. I like places like WordPress so I can get away from that kind of thinking! 6) I find creative writing very difficult, but at the same time find good books, film music and theatre hard to come by. When I do find these thing however, I am often bowled over. I’ve never written anything I’ve been completely happy with. 7) I thought the film “Monsters” was terrible, and felt betrayed by UK critics for making it out to be a viable indie alternative to Hollywood. I actually felt it was just the type of movie Hollywood would have produced had they been given only a $50,000 budget. Fantasy in Motion – Insightful posts from a would-be fantasy author explaining the mechanics behind his writing. Also has a good amount of fiction to read through, and has recently published an e-book! Broken Doll Collective – Great bits of photography and writing from a clearly very creative and talented individual. Comedy Confessions – Haven’t heard from her in a while, but then again I’m hardly one to talk. What she has written is funny stuff, so I hope she keeps this up. Maybe this will inspire you to keep going? Kevin MacNeill – A fellow cyclist and writer? ’nuff said. Reverend Gwyon – Interesting, fragmented and unusual poetry. I Just Write Something – an author currently writing a novel online with frequent updates. A pleasure to read as and when they appear. Word by Word – Frequent book reviews that can point you towards your next read.